In a production environment, mounted metal mask stencils are subject to stresses that can affect the integrity of the glue bonds. Once in production, there is a requirement to keep stencils clean and free from solder paste residues. Stencils, therefore, are subjected to frequent cleaning, often from specially designed SMT detergents in an ultrasonic cleaning bath. This cleaning process can further stress the epoxy bonds and lead to delamination at the foil to mesh and mesh to frame boundaries. Datum supplies a range of metal alloy foils for use as blanks to produce metal masks (stencils) for the Surface Mount Technology (SMT) industry. Datum also supplies foils pre-mounted onto aluminium frames using polyethylene terephthalate (PET) mesh. The mesh is bonded to the frame, and the foil bonded to the mesh using a two part structural epoxy resin. At Datum, we have been manufacturing mesh mounted frames for the SMT industry since 2008. During this time, Datum has continued to develop and optimize its process. 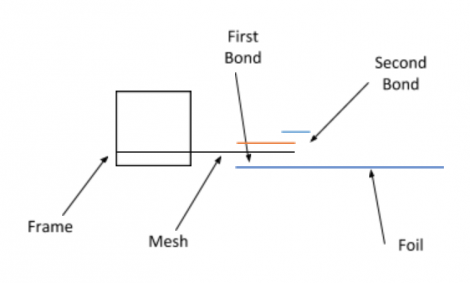 Datum applies what is referred to as a ‘double bond’ to attach the foil to the mesh. The primary bond is applied while the mesh is still in place. 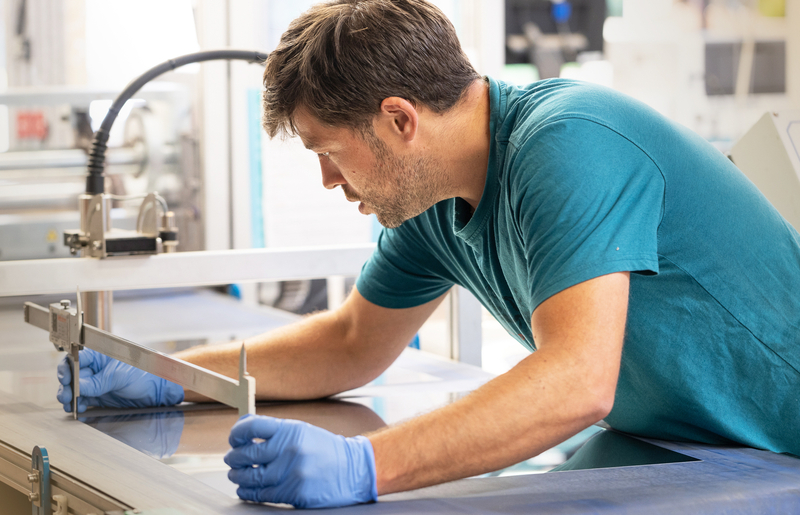 After the mesh is cut away, a secondary application of epoxy (the second bond) is applied to encapsulate and seal the cut edge of the mesh to prevent ingress of cleaning fluids. The structure of the bond set up is outlined in the diagram below. Frames were removed from the bath and inspected after every 10 cycles (30 minutes) and observed for any delamination of the mesh to foil bond. The temperature was also recorded at 30 minutes intervals. Any sign of delamination during inspection and the frame was deemed a fail. In order to test the integrity of Datum Frames, twenty mesh mounted stencil frames were exposed to a harsh cleaning regime using an industry standard ultrasonic cleaning bath and a proprietary cleaning detergent. The twenty frames tested were Datum 29” x 29” frames mounted with 0.13mm gauge, 610mm x 610mm foils. The glue border was 18mm and the foil surface was prepared using Datum’s standard preparation method. Araldite 2014-1 two part structural epoxy was used in the mesh to foil bonds and a double bond was applied. The SMT Detergent Corporation’s 440-R SMT Detergent was used as the cleaning agent at a 15% dilution (the manufacturer recommends 10 to 15%). The pH of the diluted solution was 12. Cleaning was carried out in a Smart Sonic Model 529 ultrasonic cleaner. The bath temperature was between 51oC and 55oC. The temperature was monitored using a mercury thermometer. Frames were 100% submerged for the duration of the test. The ultrasonic cleaner worked on a 3 minute cycle time. The cleaner was set to repeat cycles continuously up to a maximum of 170 cycles equating to 8.5 hours (510 minutes) of cleaning. The results of the test are included in the chart below. This study demonstrates that Datum’s frame assembly process meets the needs of a harsh cleaning environment that is representative of the kind of conditions they are likely to be exposed to in an SMT production environment. They are manufactured following an optimised process that is strictly adhered to. They can withstand a minimum of 170 cleaning cycles. All mesh mounted frames are manufactured locally.